JOIN US at THE FREIGHT & SALVAGE in Berkeley!!! Please join us at one of our favorite local venues for some new songs as well as many old favorites. Saturday, October 18, 8pm http://freightandsalvage.org/ for tickets See you there!!! Blame Sally and Monica Pasqual take home 5 IMAs! Renée is Songwriter of the Week on BBC Radio Scotland! “From San Francisco’s Bay Area, Renee Harcourt is a member of the band Blame Sally and a writer of memorable, heartfelt songs rooted in her own extraordinary experiences in life and on the road”. And we’re in good company. Other artists played that day include The Beatles, Gordon Lightfoot, Suzanne Vega, Mississippi John Hurt, Nick Drake, Bob Dylan! Two Great Reviews, The Napa Valley Register & SLC Standard Examiner! Our newest CD, Live at KVIE Studios was released with a bang, and a great month of gigs including The Napa Valley Opera House, San Francisco’s Great American Music Hall, Salt Lake City, Denver and more. The CD features three previously unreleased tracks and many favorites! Read David Kearns’ entertaining review in The Napa Valley Register and this great review, The SLC Standard Examiner. Thanks for showing such huge support for Blame Sally. We love you! Congratulations Monica & Blame Sally for your Independent Music Award Nominations! For a complete list of categories and nominees, click here. Blame Sally streaming live to your computer on February 20th! This will be our third show with Stage-it and this time we’re playing in the middle of the day so that we can reach our friends in Europe and other parts of the world. But if you live in the US – don’t think you’re not welcome. Take a break from whatever you’re doing and hang out with the Sallies for a while. 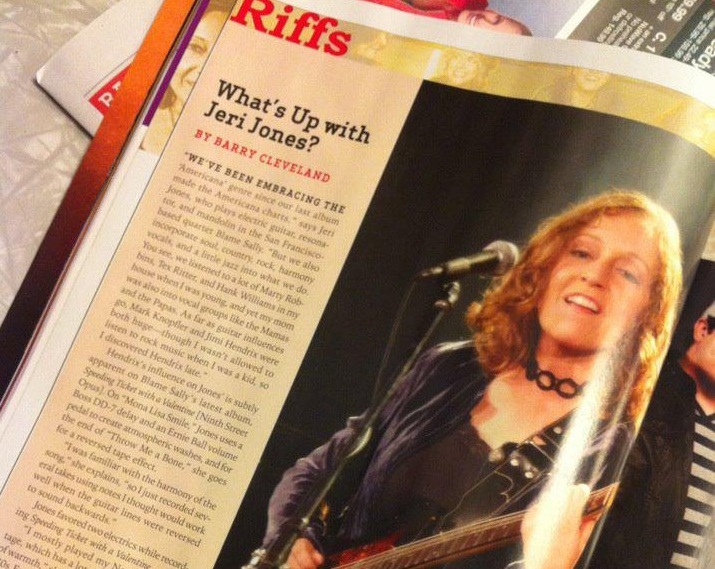 and have link in the blurb to somewhere..
Be sure to check out the February issue of Guitar Player Magazine featuring Blame Sally’s secret weapon, Jeri Jones! Also check out the video below featured on Guitar Player’s website of Jeri showing off her skills. Congrats Jeri!! Congrats to Blame Sally for making Acoustic Music Scene’s Top Albums and Songs of 2011 list! Speeding Ticket and a Valentine is #52 on this list of top folk albums, and Bird in Hand is #12 for top folk songs! Way to go Sallies! On January 23, you can catch Blame Sally perform LIVE from Monica’s House via stageit.com. We’ve never done anything like this before – it’s sure to be fun and surprising! You can purchase tickets here and pay what you can. One thing we’re sure of, it will be fun and intimate – you don’t want to miss it! Happy New Years Folks! Blame Sally is starting off 2012 with an East Coast Tour! The Sallie’s will begin their journey in New York City, sharing the stage with the lovely Nellie McKay at Rockwood Music Hall on Friday, January 6th. From there, they will be cruising to Massachusetts, Maryland, Pennsylvania, and back to New York. Check out the tour page for detailed information about each stop on the Sallie’s journey. …And don’t forget to stop by the merchandise table and check out new merchandise. Happy Year of the Dragon! Copyright © 2009 Blame Sally. All Rights Reserved.